Fathers, Mothers, Heroes: What We Know About Victims Of The Istanbul Attack : The Two-Way A father trying to save his son from the Islamic State. A brother working to support his sisters' education. A customs guard who shot one of the attackers. Three sisters, celebrating an engagement. 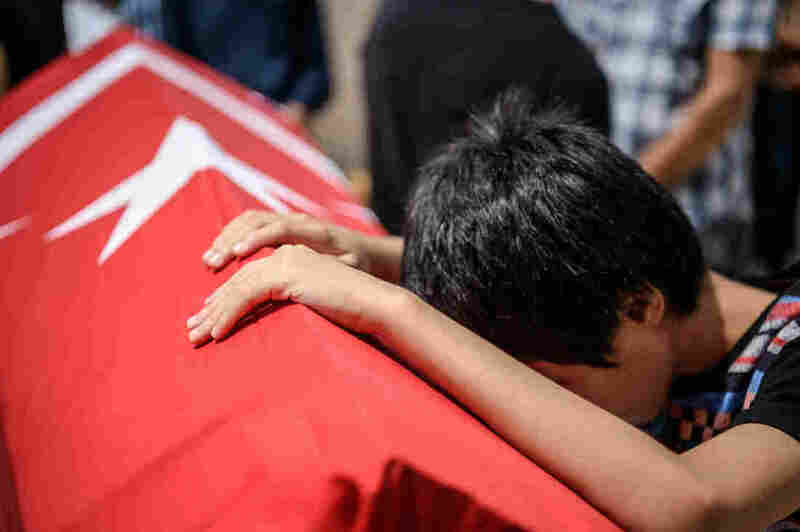 A child leans on the coffin of his uncle, Habibullah Sefer, on Thursday. Sefer, along with more than 40 other people, was killed in a suicide attack on Tuesday at the Ataturk airport in Istanbul. On Tuesday, three suicide bombers armed with guns and explosives killed more than 40 people at the Ataturk airport in Istanbul. Less than a day later, the airport was up and running, with workers sweeping away the broken glass and wiping off blood from the ceiling. Two days later, police — who suspect the Islamic State was behind the attack — have arrested 13 suspects and identified the nationalities of the suspected attackers. And the funerals have begun. Fathi Bayoudh, was a Tunisian military doctor, the head of a pediatric ward. But he wasn't in Turkey for his job. "We're hearing ... he had actually been in Turkey to save his own son from ISIS," NPR's Leila Fadel reported on Morning Edition. "And then he died in what may have been an ISIS attack." A cousin of Bayoudh's told NPR that Bayoudh's son had run away from home to join ISIS earlier this year. traveling to Iraq and Syria. Bayoudh came to Turkey to track him down, and over the course of a weeks-long stay, found him. His son is in Turkish custody, according to the cousin. A Tunisian official who spoke to The Wall Street Journal confirmed that Bayoudh's son was in custody, and said he was preparing to be deported. Once Bayoudh's wife found out that her husband had found their son, she booked a flight to Istanbul, the cousin says. Bayoudh was at the airport waiting to pick her up. Umut Sakaroglu was a customs officer. He reportedly died trying to stop one of the suicide bombers, and has been celebrated as a hero in local media and online. "After firing at one of the three armed gunmen attacking the airport and wounding him, Sakaroglu died when the attacker detonated his suicide vest," The Associated Press reports. Yusuf Haznedaroglu was engaged to Nilsu Ozmeric, the AP reports, and their wedding was less than two weeks away when Haznedaroglu was killed in the attack. "On Thursday, Ozmeric stood weeping over her fiancee's coffin, her engagement ring dangling from her neck," the wire service writes. Haznedaroglu was one of several airport employees killed while they waited for a bus home. Mustafa Biyikli, Ali Zulfikar Yorulmaz and Erol Eskisoy, all taxi drivers, were killed in the attack, according to the AP. Eleven others were wounded, the AP reports. 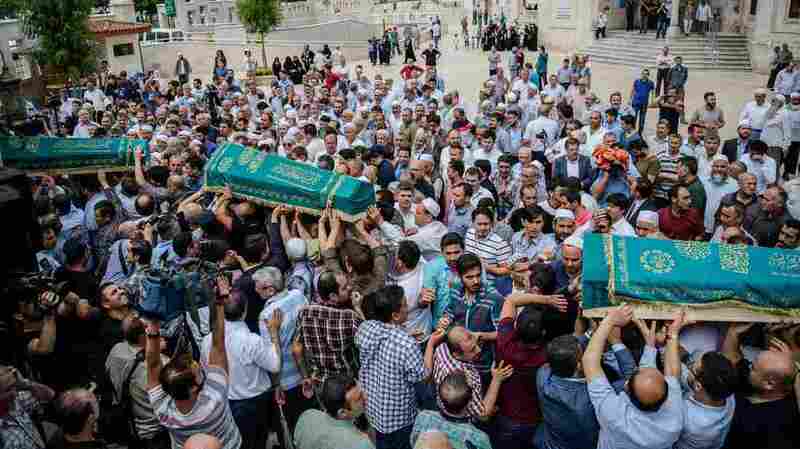 People carry the coffins of Meryem Amiri, Karime Amiri, Zehra Amiri and Huda Amiri during their funerals on Thursday, two days after they were killed by a suicide bombing and gun attack that targeted Istanbul's Ataturk airport. Kerime, Meryem, Zehra and Huda Amiri -- three young sisters and a niece — were of Afghan-Turkmen origin but living in Saudi Arabia. They were traveling with a fourth sister, who was injured in the attack. NPR's Leila Fadel, who attended their funeral, says Kerime, a woman in her early 20s, was engaged. The family was traveling to prepare for her wedding. Huda was just 9, Leila says. Muhammed Eymen Demirci, 25, aspired to be a cabin steward, but was unable to find a job for more than a year after graduating from Istanbul University, the AP reports. He was thrilled in May when he was hired by the Ataturk airport's ground service, the wire service writes — because finally having a job meant he could help fund the education of his two younger sisters. Demirci was a black belt in taekwondo and "an excellent football player," the AP writes. Nisreen Melhim, 28, was traveling with her husband and 3-year-old daughter on vacation, the AP reports. They worked in Saudi Arabia, and were stopping off in Turkey for some relaxation before heading home to Palestine for Ramadan. Another young couple was also in Turkey for a Ramadan trip — Sondos Shraim, her husband and her 3-year-old son, Rayan. The AP describes Melhim and Shraim as friends. Melhim's daughter was injured, as was Shraim's husband. Melhim, Shraim and Rayan all died. Habibullah Sefer recently graduated from college. He died in Tuesday's triple suicide attack on an international airport in Istanbul. Habibullah Sefer had just recently graduated from college, Leila reports. The 24-year-old was at the airport to pick up friends of his arriving from Saudi Arabia. At his funeral, his coffin was draped in a Turkish flag, Leila says. "His family said he was fun, loving and smart," she says. 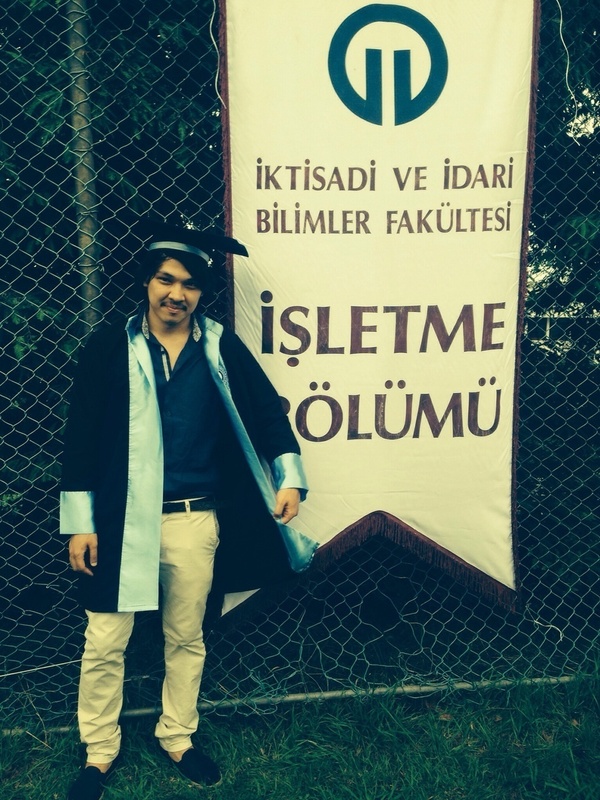 Serkan Turk graduated from Trakya University last year after studying physical education, the AP writes. Local media report that Turk died after running toward the sound of explosions to help the wounded, the AP says. BBC Turkey reports that Naciye Cinar, a mother of one of Turk's neighbors, told reporters that Turk was there to pick her up. "Serkan noticed that something was wrong and got inside the terminal building to find me," she says, according to the BBC. "The bomb exploded as soon as he got inside." Merve Yigit was 22, the AP reports, and had been working in catering at the airport. Gulsen Bahadir, 28, was an only child, the wire service writes. "Her mother Fahriye Bahadir was in tears during her daughter's funeral on Wednesday: 'What has my daughter done to them?' "
Larisa Tsybakova of Ukraine was on vacation with her husband and son, according to the AP. The 46-year-old died of blood loss. Murat Gulluce had four daughters, whom he called his "princesses" on social media, the AP reports. He had worked as a jeweler, a greenhouse cultivation business owner and a hotel manager. Adem Kurt and Caglayan Col were both employees of the airport who frequently made trips to their hometowns — in the provinces of Bursa and Eskisehir, respectively — to visit their families, the AP says. "Close friend Kemal Han said that he had spoken by phone with Ustabayev shortly before the attacks.
" 'He loved Turkey and had many dreams,' Han told the state-run Anatolia news agency. 'Terrorism destroyed both those dreams and his love of Turkey.' "
Information is still coming out about the victims of the Istanbul attack. We will share only information that we believe to be credible, and will update as more families of victims come forward to the media.